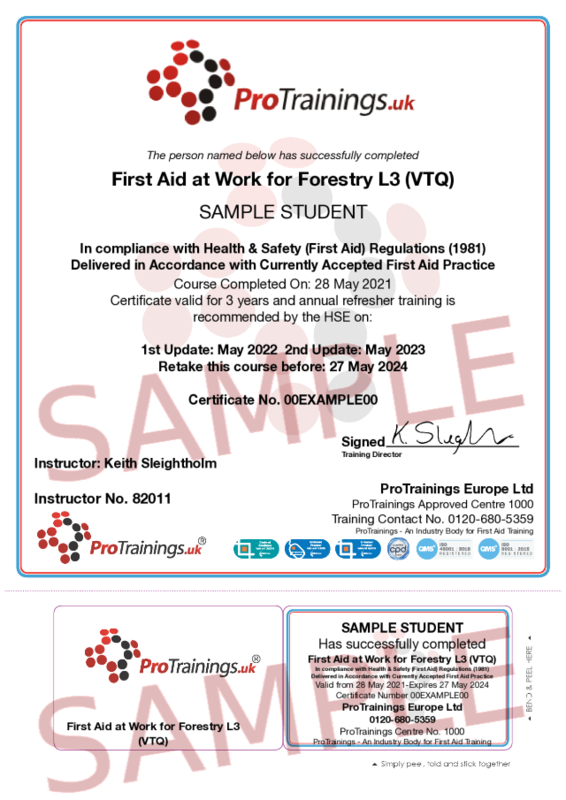 The ProTrainings First Aid at Work for Forestry Level 3 (VTQ) course (FAW-F) is ideal for most businesses whose risk assessment has identified that they require a fully trained first aider for their workplace. This course is available as a ProTrainings CPD certified qualification, all courses are delivered, evaluated and quality assured to meet the new guidelines set out by the HSE in October 2017 and meet the requirements of the First Aid at Work (First Aid) regulations 1981 and subsequent 2017 changes. This version of the FAW-F course includes the extra subjects required by the Forestry Commission to include extra subjects covered include severe cuts like chainsaws, crush injuries, Hypothermia and Lyme Disease. Also included to comply with the latest HSE and ERC guidelines, are Tourniquets and Haemostatic dressings. This course must be at least 20 contact hours and run over a minimum of 3 days and the certificate is valid for 3 years. To renew you need to attend a 2-day FAW-F requalification course. In May 2016 the HSE and Awarding Organisations announced that computer-based blended training is now allowed for all workplace first aid courses. You can now renew your First Aid at Work qualification, with one day of classroom training after completing this online course. Reduce your training and travel costs by using our engaging, blended online video-based course. Learn at your pace, one to one with your instructor at a time that suits you. This blended FAW Requalification course meets all of the requirements under the HSE and Awarding Organisations and is available as a ProTrainings or Regulated Qualification. If you prefer the traditional 2 days First Aid at Work Requalification course, we can do that too, just contact us for more information. A modern approach to training backed up by years of experience delivering online, blended and classroom courses. Clear, concise and engaging, when you choose ProTrainings you reduce the cost, not the quality of your training. Candidates completing our FAW-F courses receive access to our video library for refreshing skills and reference. The HSE and Forestry Commission, strongly recommend that all first aiders complete an annual first aid refresher courses and our online course meets this requirement. The ProTrainings First Aid at Work Qualification is accepted by TQUK as a qualification for first aid instructors who wish to offer their regulated qualifications. This is because it meets all of the required learning outcomes and due diligence.